The team went to Croft full of confidence and expecting a good result. However, due to clutch problems throughout the weekend, this was unfortunately not the case. Testing, although wet, went well on the Friday. However, come Saturday, the track was drying and we found the clutch was slipping and therefore not allowing Lewis to get the power down when accelerating. We did not have a spare clutch, so this was a problem and resulted in qualifying in 7th position. Race 1: After calling Hyundai for part numbers we tried sourcing a clutch locally without any luck, the team frantically phoned all of their contacts hoping to find a spare somewhere and Lewis was lucky enough to call Race Parts in Oxford who had one that we thought would do the job. A courier was arranged and at 10pm that night, the clutch was delivered to Croft. The clutch was fitted first thing on Sunday and we thought we were ready to race. However, without being able to test we had no way of knowing if the problem had been cured and unfortunately it turned out that the problem was still there and the best Lewis could do in the first race was 6th. Race 2: Between races the Essex & Kent mechanics took off the gearbox and changed the pressure plate on the clutch then put it back together keeping our fingers crossed that this would solve the problem. Due to the work we had to do, Lewis was forced to start at the back of the grid, but he got off at a fast pace and started to move through the field only to get a blow out on one of the front tyres. With a pit stop to change the wheel he was now obviously out of contention, but wanting to show how the car could perform when everything was right, he continued to put in the fastest laps of the race finishing in 6th place. Lewis finished with the fastest lap time which was just 0.012 off of the lap record. Lewis proved once again that given the right equipment he can compete with the best TCR has to offer, roll on Donington. 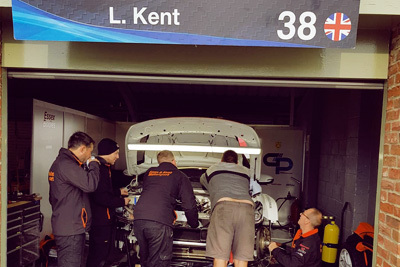 This entry was posted in Race Reports, TCR UK and tagged Croft, Essex & Kent Motorsport, Essex And Kent Motorsport, Lewis Kent, TCR UK, TCR UK Touring Car. Bookmark the permalink.